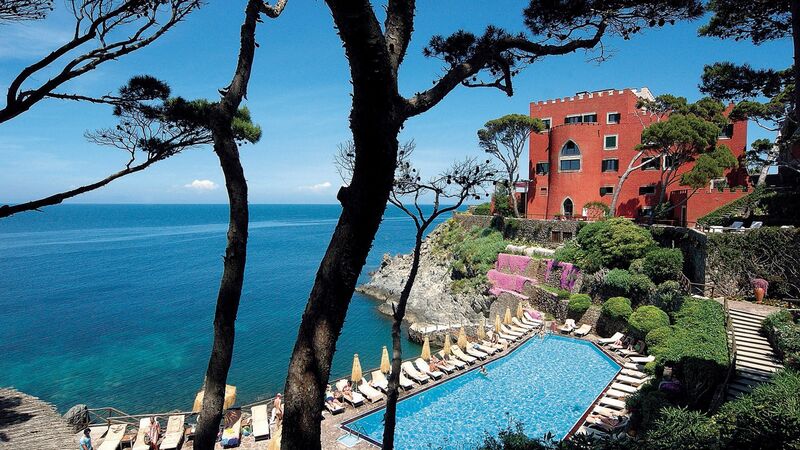 Mezzatorre Resort & Spa is as special as it gets. Surrounded by seven hectares of pines and located in an epic 16th Century former defense tower on a cliff edge, this hotel is a proud member of 'The Leading Hotels of the World'. Set up high and out to sea, guests of the Mezzatorre Resort & Spa will love the spectacular views of San Montano Bay to the left and the blue waters of the Tyrrhenian Sea stretching as far as the eye can see. The interior is simply palatial. Not only has it kept to the original watchtower design, it’s filled with plush, flowing fabric, elegant furniture and unique finishes. You’ll feel like you’re walking onto a film set. The dining options and spa are just as opulent and luxurious, making this the perfect spot for an almost fairytale like romantic getaway. The hotel has 57 rooms and suites. Hotel Child prices apply to ages 2–12 years. This restaurant is the epitome of the phrase ‘dining in style’. A truly next level experience. And not only in terms of the views, which are of course breathtaking, but the food. A fusion of traditional and contemporary, every plate is like a beautiful piece of art. And tastes every bit as good as it looks. Book early to secure one of the famous window tables and enjoy a romantic candlelight dinner with your loved one. 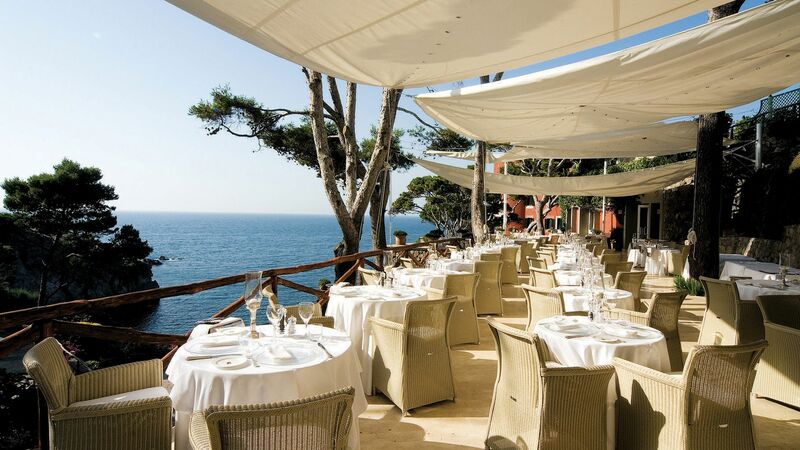 This palm-lined informal eatery has stunning sea views, a relaxed atmosphere and refined food. Pop in for a light lunch by day, or an intimate dinner for two by night. Open for lunch and dinner (Jun-Sep). Choose from not one, but four swimming pools. 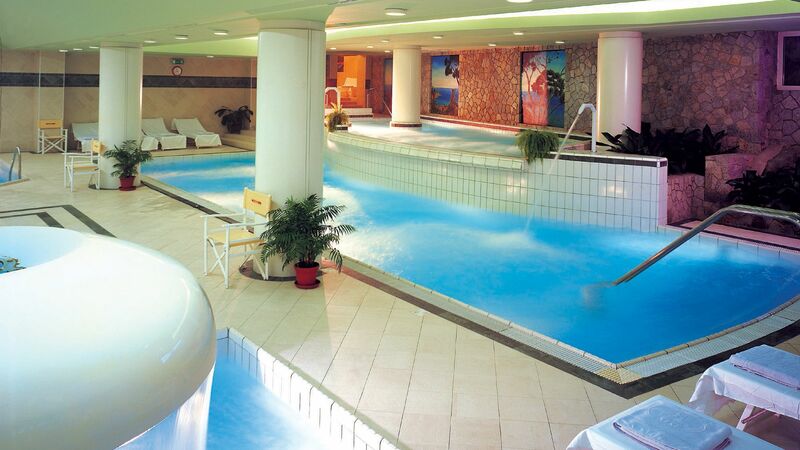 The three heated indoor pools are in the resort’s spa and are filled with thermal spring waters. Fitted with a hydromassager, you can enjoy peace and tranquility under a cascade of warm, soothing water. Enjoy sweeping views of the Epomeo Mountain and Gulf of Naples from the outdoor pool, which is situated directly above the bright blue Mediterranean Sea. Relish in a bit of ‘me time’ and take yourself to the resort’s five star luxury spa, which is located in the impressive tower. With its marble furnishings, serene lighting and the soothing scents of essential oils, you will certainly leave your stresses at the door. Choose from an extensive list of pamper packages, each delivered by a professionally trained skin and beauty expert. Keep in shape during your stay at the Mezzatorre Resort & Spa’s top of the range gym. Filled with state of the art equipment and weights, you can workout while admiring the beautiful views of San Montana Bay. Ischia is an ancient spa town, discovered by the ancient Romans for its warm natural springs which come down from the fragrant mountains. It’s attracted a luxury holiday crowd ever since, giving it beautiful architecture, upmarket spas and a selection of excellent restaurants. Try fresh seafood and traditional Mediterranean platters, as well as the area’s local braised rabbit. The beach stretches out for miles and offers some smaller thermal springs where you can enjoy the rejuvenating waters. Alternatively, paddle in the crystal clear waters or hop on a boat and explore the beautiful coastline, stopping off in towns like Amalfi and Ravello. Mezzatorre Resort & Spa is two hours from Naples Airport. Classic Double Park Front or Side Sea View rooms measure 24m² and are situated in Building Visconti. Rooms have one double bed, built in wardrobe and a balcony or terrace. Superior Double Park Front or Side Sea View rooms measure 25m² and are located in Building Visconti. Rooms have one double bed, built in wardrobe and a balcony or terrace with front or side views of the sea. The bathroom features a bathtub with shower and marble washbasin. Superior Double Tower Front or Side Sea View rooms measure 25m² and are located in the main tower. Rooms have one double bed, built in wardrobe and front or side views of the sea. The bathroom features a bathtub with shower and marble washbasin. Deluxe Double Park Terrace Front or Side Sea View & Jacuzzi® Pool rooms measure 25m² and feature a terrace furnished with a mini Jacuzzi® pool with fantastic views. Rooms have one double bed, built in wardrobe and a marble bathroom. Junior Suites Park Front or Side Sea View measure 31m² and have views of San Montano Bay. The room features a double bed, sitting corner and marble bathroom with whirlpool bathtub with shower. Classic Suites Tower Front or Side Sea View measure 38m² and have a view overlooking the hotel pool and the bay. Rooms feature a bedroom, living room and marble bathroom with whirlpool bathtub. Deluxe Suites Tower Front or Side Sea View measure 41m² and are situated in the tower with a terrace or balcony. Each room features one double bed, living room, and marble bathroom with panoramic whirlpool bathtub and separate shower. Deluxe Open Plan Suites Park Front Sea View with Terrace & Jacuzzi® measure 40m² and are located in the Building Foresteria. Rooms have a private terrace with outdoor Jacuzzi® and views of the sea as well as one double bed and bathroom with bathtub. The large lounge area features a sofa, writing desk, table and chairs and flat screen satellite TV. Classic Single Park or Tower Front or Side Sea View rooms measure 16m² and are located in either the tower or park buildings. Rooms in the park buildings have a small terrace and direct sea views whereas rooms in the tower have side sea views. Rooms are furnished with a queen size bed, built in wardrobe, writing desk and shower or bathtub in the marble bathroom. Unique setting amongst woodland, beautiful pool area, set on cliff, and completely private, and not overlooked, yet within easy reach of local village by hotel shuttle. Good food and service , excellent staff and comfortable rooms. Mezzanine boutique Hotel is a relaxed place with lounge music played by a DJ almost every day. Food is excellent and the service to it. Beach nearby with lovely water to swim in. Coffee and tea is served early morning to enjoy by yourself. My husband and I took my mother to Italy for her birthday and stayed at Mezzatorre. It?? ?s not the Four Seasons, but you won?? 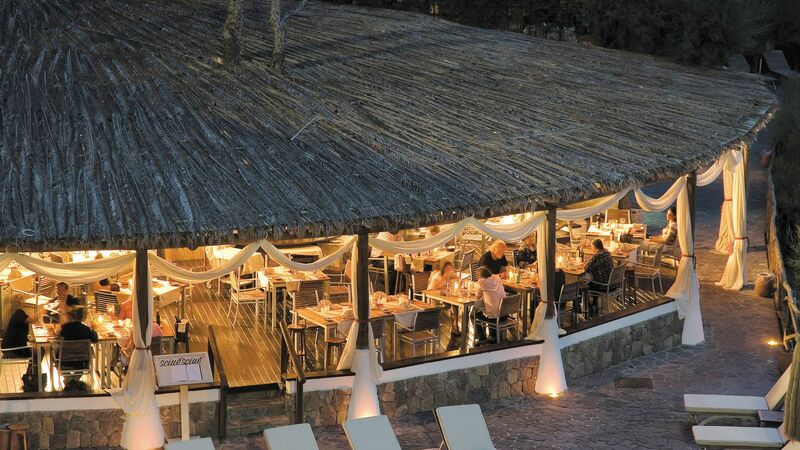 ?t find a Four Seasons or any large brands on Ischia, and Mezzatorre is beautiful and authentic. While the private location and scenery can?? ?t be beat, what makes this place are the people. Luca and Salvatore are the heart and soul of Mezzatore. We found ourselves never wanting to venture out to experience other restaurants because the food was delicious, the wine pairings from Luca were out of this world, and the warm welcomes and service from Salvatore were beyond. And the extended service team was just as wonderful. We?? ?re so grateful to everyone at Mezzatore for making our trip memorable and can?? ?t wait to visit again. Beautiful position, with its own private bay. All staff very attentive and professional but friendly too. We were half board and thought the food was outstanding. Had 2 garden rooms in a quiet area at the top of the hill, maybe they could do with a little update (shower wasn't the best) but rooms were clean and very comfortable and we were more than happy. Too busy lounging around to try the spa or the gym but they looked good. Lovely week. Our trip to Italy was our honeymoon. We took great care and measure to ensure it was a dream. This place was our favourite place. The hotel is on a cliff side remote from the towns. They offer a scheduled shuttle service should you want to explore the town of Fiorio. I guarantee you will never want to leave. My favourite spot was a sun chair right at the waters edge and I would spend my time reading and jumping into the clear water. Bring your snorkel, for sure you will want to explore the water! The spa was clean and professional. We both had massages and were very happy with the outcome. The food is spectacular. My recommend is to listen to the waiters, they absolutely know what they are talking about. If you are look for a quiet dream escape, this is it!